Having a real estate investor website is the first step to getting more leads and ultimately growing your business. Having a successful real estate investor website is the second step. There are two methods to use when working on building your web presence for your website. The first is a take-off strategy (the one which we’ll talk about in this blog post), and the second is the long-term strategy (which we’ll talk about in another blog). Both strategies boil down to the same thing: getting your site traffic. You need traffic to get your name out and to get your site attention. Think of it this way, your website is your storefront. If you have a store in a small neighborhood, across town, with nothing around it, you won’t be getting that much traffic. Similarly, if your site isn’t pulling in traffic, no one will see it. You want your storefront to be on the busiest highway in real life, so you have to be on the busiest highway online as well. Email is one of the most used forms of communication with “58% of adults checking their email first thing in the morning,” Consumer Intelligence found in a 2015 study. Because email is still rising in popularity, it is a perfect platform to subtly promote your real estate investor website. Using your email signature as a way to promote your website, even if the emails are going to people you don’t think would be interested, is a great way to start getting your website exposed. You can’t be an investor in stealth mode, and you never know who will be interested in buying, or selling. With your website URL in the signature of your emails, your website has the potential to be seen and shared with more people. Social media is quickly becoming a more common use of advertising with content rather than with traditional sales ad techniques. Utilizing social media can tie together with SEO, or Search Engine Optimization, that we talked about in our previous articles “5 Tips for Building a Wholesale Buyers List”, and “Why Am I Not Getting Real Estate Leads from My Website”. Sharing relatable content on your professional social media platforms, and linking that content back to your website, is an easy way to get exposure. Platforms like Instagram, Facebook, and Twitter are popular and useful ways to build an online presence while also promoting your site. This example is a useful tweet because it is concise and to the point, gets your audience’s attention, and links back to your homepage. Tweets, and social media blurbs like this, are useful in building followers for your real estate investor website. Building followers can be tough, but by being searchable, your followers will eventually find you. By adding hashtags to your posts, your content will appear in searches for that hashtag, or related hashtags. Keep an eye out for trending hashtags that are relevant to your post. For example, if your real estate investor website has focuses on wholesaling, use the hashtag #wholesale in your posts that link to your homepage. Posting to craigslist is another effective way to reach your target audience. However, knowing when and what to post for optimal views is important in getting positive traffic to your real estate investor website. There are different ways to make an effective Craigslist ad. No matter what, though, it is important that you have your contact information, your area of business, and an easily searchable title. Notice, in the example below, how the title is something that is easy to search, with the local area listed, while still getting the general point of the business across. From the title alone, we know that the people offering this service are targeting motivated sellers, and are doing business in the Atlanta area. Additionally, the description of services is short and to the point. You don’t want to have too much going on, keep it simple for your audience to find the information that they need. Craigslist is an interesting platform to advertise on because it is dependant on your local area. What is effective on Craigslist in Chicago might not be the same trend for what’s effective in Orlando. Additionally, you need to keep in mind who your target audience is. The writers of “Cracking the Craigslist Code”, found that posting ads on Friday through Monday is the most effective for real estate related ads. While those are high traffic days for real estate ads, it is best to continually watch your ad and record what days work best for your area. For weekday posts, the most effective time “Cracking the Craigslist Code” has found is during employee breaks (from 10am – 1pm), and after the work day (4pm – 7pm). For weekend posts, the same writers found that posting late Thursday, late Friday, and early on Saturday gave an ad better view potential. Consistency is important. If you establish a day of the week that you will be posting on, your audience will be ready for your content. Keeping your posting schedule consistent will help to build brand recognition. For your purposes, a combination of the above techniques, and good old fashioned trial and error will help you find the method that works best for you, and your needs. Craigslist ads tend to get pushed down quickly as more ads are placed. The real estate wanted and real estate for sale sections usually receive a lot of ads every day. Do not let the competition scare you! Most people fail to be consistent and that’s what’s necessary for posting to craigslist to work. If you don’t want to post the ads daily, have someone else do it. Once you post an ad, it’s usually just a click of a button on Craigslist to repost it. You should create more than one account (will require more than one email address) so that you can post multiple ads per account per day. 15 to 20 ads posted each day is not crazy and works really darn well…especially in busier, larger markets. Realize that it only takes one call from a motivated seller to land you an awesome deal that you could make thousands of dollars from. Would you spend a couple hours a month to possibly make thousands of dollars? Should be a no-brainer. Do not get discouraged, dig in and commit to posting varying ads every single day. It will pay off. 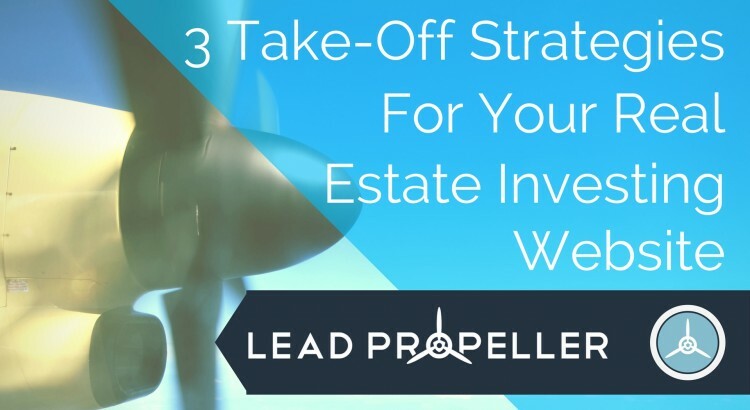 The three best ways to start your take-off strategy for your real estate investor website are: putting your website URL in your email signature, utilizing the authenticity of social media, and posting direct ads to Craigslist. While these are all great ways to start building your web presence, and ultimately moving you toward long-term success, they are still just take-off strategies. In next week’s blog, we will be discussing long-term strategies to keep your web presence relevant, and build your online followers and business. We cover Craigslist marketing for real estate investors a lot more in-depth in LeadPropeller, along with a lot of other great tactics to generate leads online. Sign up today and start generating motivated seller leads! Get your downloadable copy of “Top 5 Marketing Methods” today and start building your real estate investor business!